Hi guys! I've missed you! And I think you all know what today is, right??? Yep! Today's the day I announce the winner of the Hush, Hush contest! YAY! But, before I announce the winner, I want to share a little something with you all. This little something totally made my day! Not to mention, made me smile and go skipping into the house like a tween who just received her official Robert Pattinson fan club card (not that I would know from personal experience or anything) in the mail. Wait! Do they have those??? If so, where do I sign up??? When I went to the mail box yesterday afternoon, here is what I found. A package from the lovely and very talented Kristi! Now, seeing this alone would make me smile all day, because, I mean, who doesn't love to get packages?? Unless... it's a package full of rocks or something. But, I don't know, that might still be cool?! Want to see what's inside??? I know you do! CANDY! Does it get any better than that??? Umm... NO! 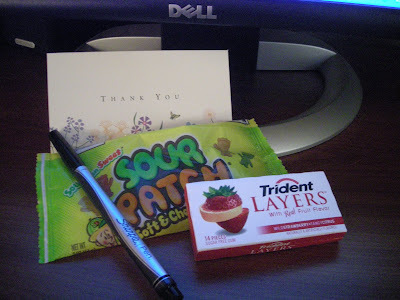 And gum (Kristi, are you trying to tell me something??)! And, like, the coolest pen ever! 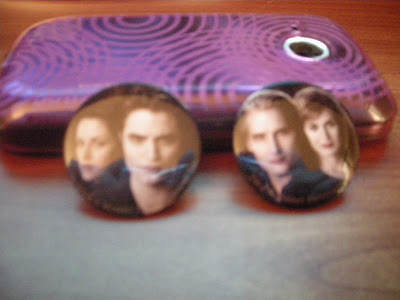 My package also included Twilight buttons!!! This little surprise really made me smile, as I'm sure it would for anyone who had an entire room devoted to Twilight merch. Kristi claims she tried to fit Robert Pattinson, himself, in the package. But she says, "He just wouldn't fit." HA! I think she's lying. She just wanted to keep him all to herself. 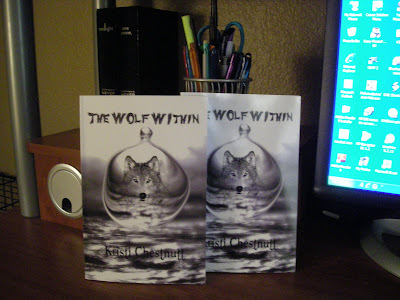 This lovely package not only included one copy of Kristi's fabulous book, The Wolf Within, but TWO! Yes people, you heard right! TWO books made of pure awesomeness were in this package!!! And one of these books was even customized just for me. Little ole me! And that right there would have been enough, but NOOOOO! 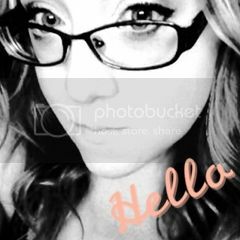 My good friend, Kristi, is just that awesome!! and not ONE but TWO of the best books ever, was something else. Something so cool I actually screamed when I saw it for the first time. I think if you read that little picture below you will see what I'm talking about. Did you see it? Did you see my name??? That's right, people. I'm officially in PRINT! It would appear my subliminal messages to Kristi worked. Thank you so much, Kristi! You are quite possibly the sweetest person ever and I'm so happy you are my friend [Kim is your bestest friend EVER. Don't forget it!]! Now give this lady a round of applause, because she ROCKS! And, for putting up with me, she truly deserves it! YAY! 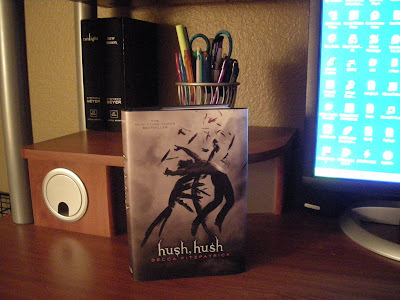 Okay, now to announce the winner of the Hush, Hush contest! I'm relying on a random name picker (that looks like a slot machine... so much fun) to choose a winner for me. Because you all know how I am with picking winners, right??? LOL. If it were up to me, everyone would win. But, everyone can't win. That's not how these contests work. DUH! Oooooo....ahhhhh. So very pretty, isn't it?! Congrats to Debra! Luck was on her side today. Maybe she should go play the lottery! If you could please e-mail me at Kimlfranklin@gmail.com with your shipping information I'll get the swoon-worthy Patch to you right away!! Before I leave, I want to thank everyone for participating. I couldn't do this without all of you, my blog buddies! And I have another contest (drool-worthy for sure) coming soon!!! Be excited! Very, very excited!! I'm glad you liked the link I sent you. How many times have you watched it. I am jealous of your buttons :) I have already added that book to my list and congrats on being in print. Congrats to Debra--I think you will become a Patch fan when you are finished. How my gosh how super cool that you made it into the book!!! How flippin special!!!! Congratulations! How awesome to get two copies as well! Look at you! Everyone here knows your fabulous now the whole world will!!!! Way to go to Kristin as well!! Wow, what an amazing gift. I love it when you find your name in print. It's the best feeling in the world. 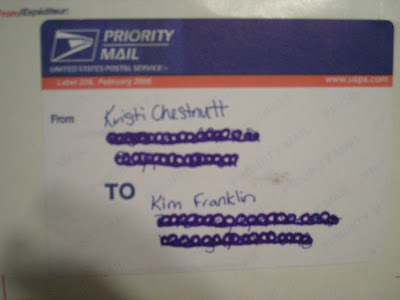 Kim - I think reading your post was *almost* as fun as putting the package together!!! Okay, it was WAY BETTER than putting your package together...I loved it! Although I have to admit, both were quite fun. I love surprises. And who knew your subliminal messages worked so well? LOL. You are a master! I'm DEFINITELY buying Hush, Hush this weekend!!! I have to see what this Patch thing is all about! And thanks for adding. I have two copies I will be giving away in a week or two... so.... YAY for contests!! Thanks again, Kristi! I've said it once, but I'll say it again. Sometimes I think, without you and Kristin I would be one insane lady right now! I can't wait to hear what you think about Patch....sigh. That is the best thing I have ever seen! WHat a great day for you!!! HOW COOL!!! Kristi is so sweet! Jennifer - Yes she is. Too sweet! I hope you have a great weekend! Joanne - Getting any package in the mail is always fun. Or, maybe, I'm just weird. LOL. Kimberly, you are so great! Your blog is a bright spot in my day. 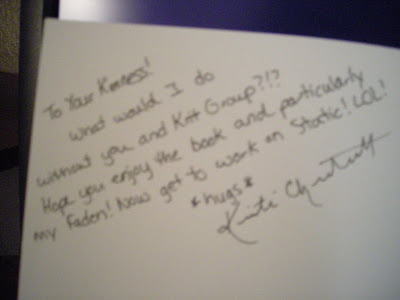 Congratulations on the shout out in the book and all the wonderful loot. You are a lucky girl! Have the best weekend, and do something fun you can post about later. Blogger seems to want to make me hate you, Kim. ): It keeps saying that your blog doesn't exist whenever I go click on it. So I apologize for just disappearing on you. Anyways....congrats on your present from Kristi. XD I can imagine how excited you must have been. That's so exciting! Yay to all those sweet surprises...you deserve them! Thanks! And, actually the first time I saw that page was when I was at work. I had to hold in the screaming tween that was about to burst out of me when I saw it. LOL! That would have been embarassing. That is one of the coolest packages ever! Way cool. That is SOOOOO COOOL!! Kristi ROCKS! You ROCK! And now Debra ROCKS!! What a great end to the week. Candy! Will you share? I love those things! Sounds like your day was made, she's the best. And yay for the winner! That package must have put a big smile on your face! How wonderful to have a mention in the book and candy in the stomach, and Edward on your shirt :)! Shannon - YES, it is! Have a great weekend!! Eva - Of course I will share! I only ever eat the red ones, anyway. LOL! Susan - I know, right? That would have been so awesome if she could have just stuffed Robert in there. Maybe next time she needs to just buy a bigger box. LOL!